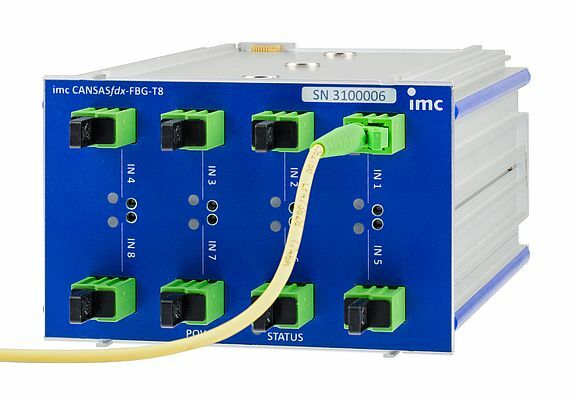 imc Meßsysteme is presenting a fiber-optic CAN measurement module, imc CANSAS-FBG-T8. It applies specially developed fiber Bragg grating sensors (FBG) at eight optical inputs to measure temperatures in high voltage environments and outputs the results via CAN. Thanks to the optical measuring principle it is independent of any electrostatic and electromagnetic influences. Thus all such EMI/ESD related concerns with errors, signal artifacts and even damage, that classical measurement technology used to be plagued with in HV contexts, can now be a thing of the past. The topic of personal safety, which prescribes comprehensive protective measures when working on voltages of more than 50 V, is also clearly reduced: the fiber-optic based sensors have no electrical conductivity whatsoever. This means that there is no need for special safety equipment or particular training of the operating personnel. Elaborate and expensive high-voltage cable insulation is unnecessary. The particularly thin FBG temperature sensors with diameters down to 0.5 mm make installation easier and enable completely new applications. They can, for example, be directly integrated into the windings of an electric motor without significantly influencing its properties. Larger conventional sensors would alter the motors magnetic fields and potentially introduce irregularities or even mechanical noise. The fast response of the fiber-optic sensor can then precisely detect and record the dynamic temperature changes in the windings under load. This is a task that was previously almost impossible to solve with conventional sensor technology (PT100 or thermocouple). The FBG module is electrically and mechanically compatible with the imc CANSASflex series. Users can dock directly to any existing measurement module of the flex series via the integrated click connector. This means that the entire imc portfolio of classic electrical measurement technology is available, too. The intelligent imc BUSDAQflex CAN data logger can also be directly clicked on, thus allowing fiber-optic and electrical measurement modules to be combined into a fully integrated measurement system. A wide variety of measurement, testing and even control applications can be flexibly covered, and a wide range of vehicle and industrial buses can be integrated.